I’d struggle to pinpoint the precise moment when I decided that I’d eventually move beyond writing about New York wines, but a visit to Black Ankle Vineyards in Mount Airy, Maryland (on the way to TasteCamp 2012, which took place in Northern Virginia) certainly planted the seed. Before visiting, I had heard about a couple making what several friends deemed “delicious albarino” in Maryland of all places. That day I got to spend some time with co-owner Sarah O’Herren, who walked me through the vineyards, talked about what they’d accomplished and what they still had ahead of them. The albarino may have gotten me there, but it was the syrah — and Sarah’s extreme hospitality — that have held my attention since. My most recent visit was last year for TasteCamp 2017 where we got to taste an incredible vertical of their syrah as well as their Bordeaux-style blend. These are some of most age-worthy wines in the Mid-Atlantic region. 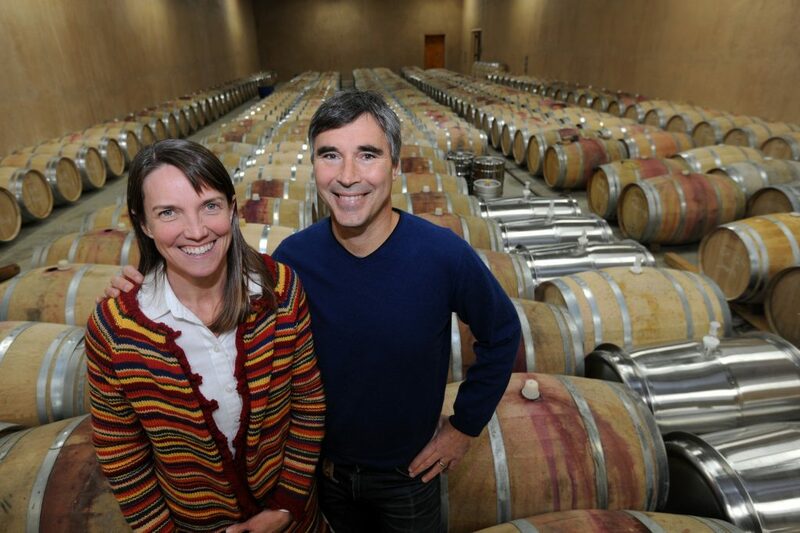 Sarah and her husband, Ed Boyce, share all duties at the winery — including answerin my tastemaker questions, although Ed is the main voice below. Get to learn just a bit more about Ed Boyce & Sarah O’Herron, the power couple behind the first winery I know of to go all-in on quality wine in Maryland. They are true tastemakers. Before I Became a Winemaker: I was a Management Consultant, on a plane 3 days a week for 11 years, working for very large companies helping them to improve their operations. I went from an itinerant life to literally having roots in the ground! What I’m Drinking Right Now: Last night at dinner we opened a bottle of 2009 Chateau Pouget, the Margaux Fourth Growth which is one of the properties of our Consultant and Mentor, Lucien Guillemet. A superb wine from a superb vintage, yum. The First Bottle of Wine I Remember Drinking: I don’t remember the first bottle, but I remember the “aha” bottle — 1979 Mouton Rothschild, drunk at a family gathering. That vintage get’s very little love, but I thought it was just beautiful – it got me hooked on wine, and started a long tradition of seeking out “mediocre” vintages from great vineyards – they often are much better than advertised, and almost always compliment food very well. Our Winemaking Style: For whites and roses, we prefer our wines to aromatically intense, to have some palate weight without heaviness, and to be on the “fresh” side of the acid-sweetness balance. For reds, we concentrate on the feel of the wines rather than the taste — concentration, length, palate consistency, lack of astringency, etc. The taste and aroma need to be good and intense, but we don’t really care if the wines tend to red fruits vs. black fruits, or taste of forest floor or lead pencil, etc. We want our wines feel right, and our ultimate goal is to make red wines that are concentrated without being heavy (not an easy thing to achieve!). The center of our process is always the blending table. We are committed to making the best wines we can make and having consistent quality for our customers. That means de-classifying wines in a poor vintage and making almost no varietals (the blends are almost always better, and certainly more consistent year-to-year). We even blend across vintages and make non-vintage wines if we like them better than the vintage options, and some of those wines have been our most popular. My Mentors — Wine and Otherwise: We owe a great debt to Lucien Guillemet (Chateau Boyd-Cantenac and Chateau Pouget, Margaux) who has been with us from the start. He has taught us so much about winegrowing, and given us the confidence to try things that seemed crazy at the time but helped make our wines what they are. The Music Playing in the Cellar Right Now: The cellar seems like one of the few places left in the world which does not have music/television playing constantly, and so we really enjoy the peaceful silence when we are topping barrels, tasting wines, etc. Our Favorite Thing About the Maryland Wine Industry: Customers who discover that Maryland can actually make great wines. The smiles on their faces make it all worthwhile. What We Wish Was Different About Maryland Wine: We could use more wineries pushing the envelope of quality so we can learn from each other. A rising tide would lift all boats. On a Random Thursday Evening, You’ll Find Us Drinking: We usually drink wines that we can learn from, and rarely drink our own (trying to avoid a cellar palate). We spent a few days in Burgundy in April and brought home a couple of cases of wine, mostly from Santenay (not too pricey, but really nice). The whites are intriguing to us as they appear to pick the grapes less ripe than we do, then go through full malolactic fermentation (ML), giving them really fresh wines with very soft, rounded acidity. We have traditionally let our chardonnay hang longer, then blocked ML to preserve acidity, but we may be changing that style decision. To add to our 2004 1/2 acre experimental pinot noir block, we also just planted 2 acres of pinot on a steep, east-facing slope with lousy soil and lots of rock, so we are trying to do a similar analysis on the red Burgundies to hone our style. I guess this is lame, but even on random Thursday nights we are usually “working”! Our Last Meal on Earth: We’d start with a great bottle of Champagne, then Sarah would go for a homemade lasagne with Andre Brunel Chateauneuf-du-Pape, then cake and ice cream for dessert. I’d add a bottle of a great dry rose with the lasagne, then have a selection of cheese for dessert with a Zind Humbrecht Vendage Tardive, maybe Rangen de Thann 1994. Pupusas/tacos would be my alternate dinner, or maybe Pho. So many choices!